Builtin high speed RSS and Atom engine. Enhanced support for YouTube feeds. Clean, stylish and distractionfree user interface. Article list with thumbnails, adjustable in size and alignment. Builtin browser for viewing inline links and other references. Font of the news article body and header are adjustable. Use Reader view to download and read the full version of articles in a clean and easytoread format. 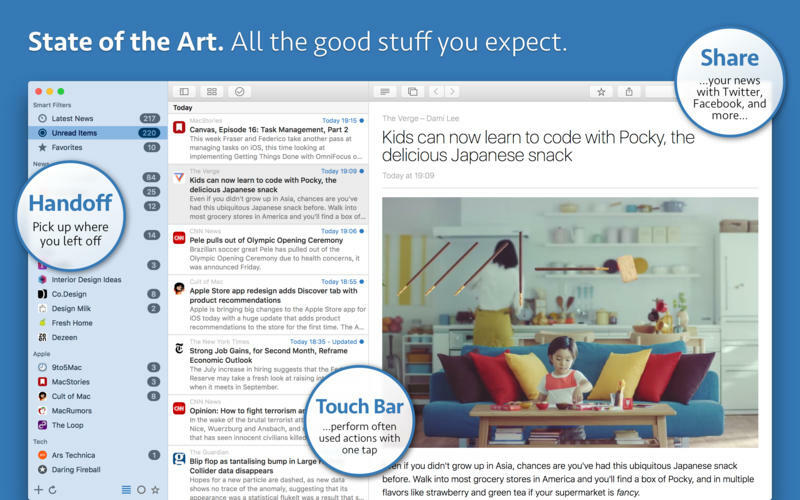 Timeline view shows your news items in an attractive newspaperlike way. Builtin image viewer to browse through all images of news items. Builtin support to share news items with Instapaper and Pocket. Add new RSS, Atom, JSON, Podcast and YouTube feeds directly from Safari, using the ‘Add to News Explorer’ share extension. Add RSS and Twitter feeds via the builtin search form. Rename and reorder folders and subscriptions, using draganddrop. Feed manager let you manage the feeds that should be displayed in the Notification Center. Support for enhanced arrow key navigation with auto expand and collapse of the sidebar and the builtin browser. Supports feeds with Basic and Digest HTTP Authentication. News Explorer for Mac is available on the Mac App Store. News Explorer for iPhone, iPad, Apple Watch and Apple TV is a universal purchase app, available on the App Store of the mentioned devices. Universal purchase allows you to purchase News Explorer once, and then access it on all connected platforms. ● Fixed an image extraction bug that may cause a crash with some feeds. ● Fixed an app icon unread badge update issue when using ‘Mark All as Read’ in the Timeline view. ● Added a setting for the new automatic image resizing feature introduced in 1.8.12.